All transactions are safe and secure with a reliable history in online purchasing behind each of our associates. Buy the Zach Galifianakis Human Tree t-shirt to own Hangover clothing and merchandise. Zach Galifianakis gave the performance of his career as Alan in this movie. 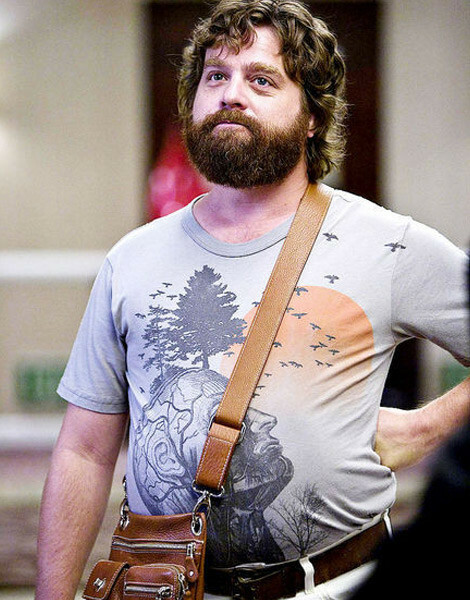 The Hangover Human Tree t-shirt Alan wore is easily recognizable to any fan because he had so many memorable moments in it. For instance, it's hard to miss when it's practically the only thing he is wearing when he encounters the tiger in the bathroom. It also stands out when he is tasered in the face by a child. Grab this tee or the Weekend Forecast shirt for a great Alan Hangover costume. Check out the gallery to find the perfect accessories, including a costume beard and Alan's Blublocker sunglasses. In addition to the Zach Galifianakis Human Tree tee above, browse the Hangover Clothing Gallery for more apparel like men's and women's clothes, kids shirts or hoodies.